Today we are going to visit Madrid Spain, where design professionals Kele Voy A Hacer have taken a run down, small and cramped little terrace and turned it into a little outdoor oasis. As South Africans, we know how important it is to have quality outdoor spaces where we can enjoy the beautiful weather in our country. Even if we don't have too many square metres available, we need to make the most of the outdoor area that is available. This is exactly what the designers have done here. They've made sure that every square inch is beautiful, functional and appealing—a good lesson for all of us. Because many of us use our small patios or terraces for storage or we just dump some old furniture onto it. This should not be the case! We hope that this project inspires you to really make the most of your outdoor space and see just how much potential it holds. 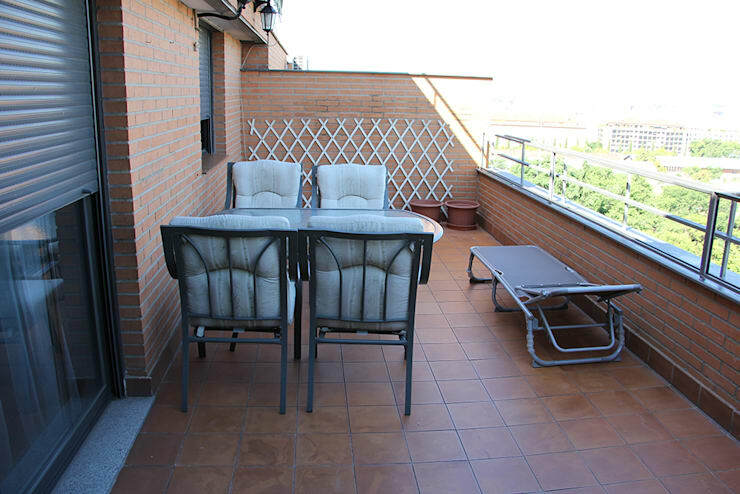 While this little terrace features a sun lounger and outdoor dining area it is very bland. The terracotta tiles and plain brick walls do nothing to enhance this space. Everything looks drab and brown. While the furniture is durable and functional, it isn't very aesthetically pleasing. The pots are also bare of plants or life, which is a wasted opportunity. Yet this space has so much potential. It features panoramic views of the surrounds and more than enough space to create a little outdoor haven. The designers have injected the whole area with colour and life, using textiles and vegetation to create a beautiful look and feel. What's more is that this isn't a very expensive renovation. The floors and walls are the same, it's just the features that have changed, bringing personality and charm to the terrace. The furniture is also made from recycled pallets, if you can believe it. Painted a dark, chocolate brown, the pallets are the perfect foundation for some soft, comfortable and trendy white sofa cushions. Have a look at these tips: cool furniture for almost nothing using pallets. The dining area has also been spruced up with some colourful place mats, a pot of fresh flowers and colourful cushions on the chairs. These are little and cost-effective changes that make a huge difference. If you have the space, a dining area outside is a must. It allows you to enjoy lunches in the fresh air or dinners under the stars. If you can fit a braai into this area, even better. Tip: A glass dining table is great for an outdoor area as it is durable and will last in all weather conditions. It's also very easy to clean. As we can see in this design, one way to really bring life and soul to the terrace space is to include as many colourful plants, trees and flowers as possible. This refreshes the entire look and feel. If you're short on floor space, a vertical garden is a very modern alternative to decorating. By installing a garden across a vertical wall, you can create a very energetic and lively design that truly attracts the eye. It's the little details that make a very big difference. 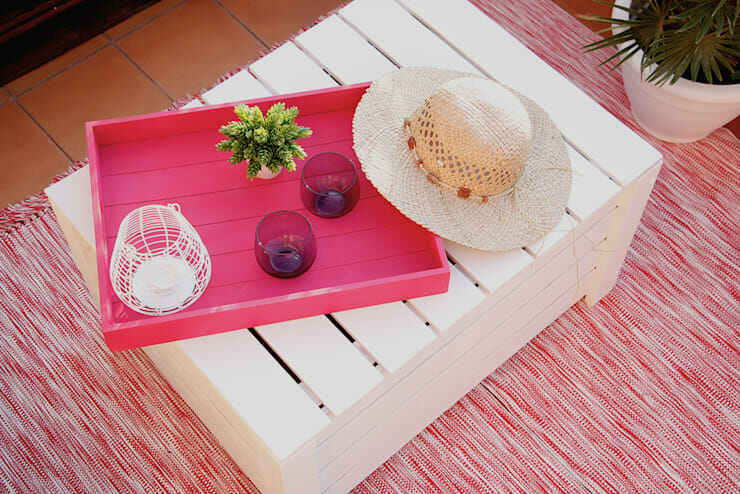 As we can see in this image, a little candle, a pink tray, some pretty glasses and a sun hat are the perfect little touches to create a feeling of relaxation and rest outdoors. 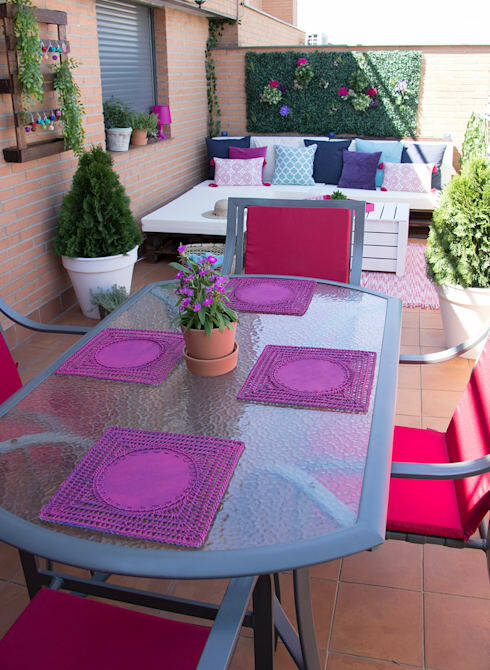 Don't be afraid to let your personality shine your terrace! This is also another great example of how a pallet can be used to create a functional and trendy piece of furniture. 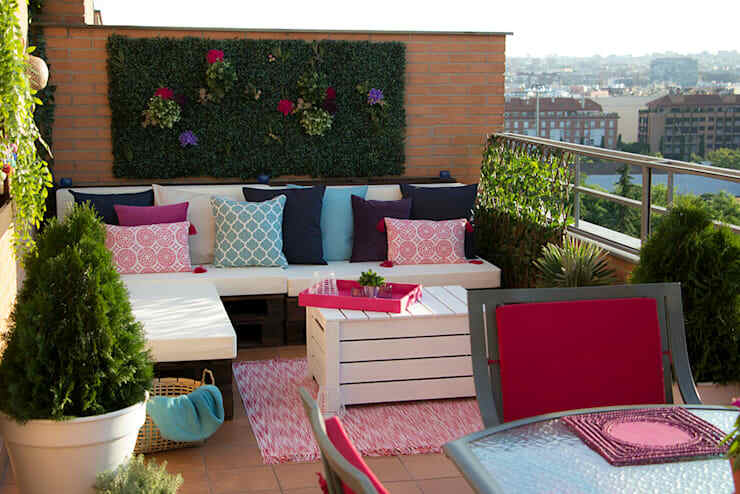 Tip: Add a colourful or patterned rug to the terrace to create a bit of warmth and cosiness. 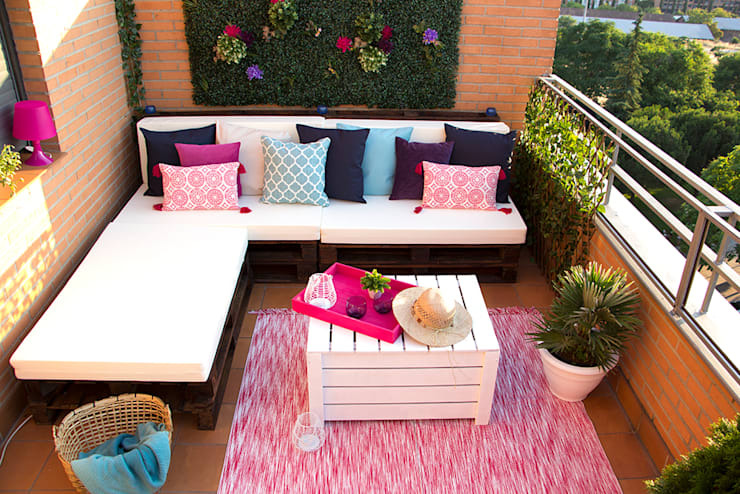 In this image, we can see how textiles such as patterned cushions and rugs create an outdoor space full of personality and style. Don't just reserve these items for the indoors. 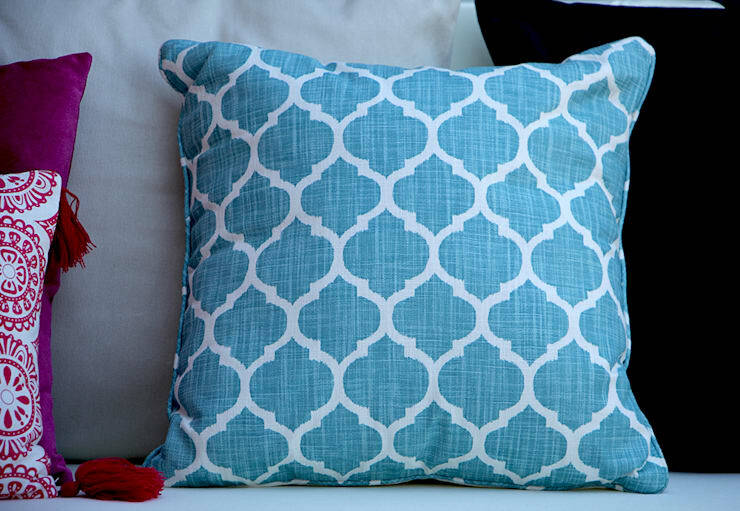 Cushions are also the cherry on top of an outdoor design, bringing comfort and cosiness to the space. Couldn't you imagine relaxing on this sofa with a good book and a glass of wine? Finally, we can see what a big role lighting can play in the evenings when it comes to terraces and outdoor spaces. It creates mood and ambiance, creating a beautiful look and feel. 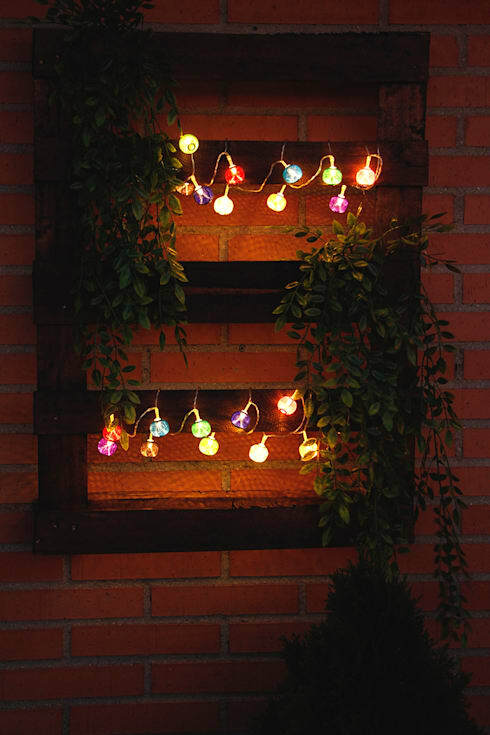 Opt for coloured lights that hang among the trees like in this image, which really creates quite a whimsical design. Do you see how much potential an outdoor space can be? If you've enjoyed this article, you'll love this one too: Before and After: 5 Balconies Renovated. Are you inspired to change your outdoor area?